WealthVest is the premier financial services distribution firm of fixed and index annuities to registered financial advisors according to Cramer and Associates. The most important role we play in financial services distribution is providing the training and tools to make your advisors extraordinary, said Wade Dokken and Lincoln Collins. In a recent survey conducted by Cramer and Associates, WealthVest topped the list of independently owned distributors of fixed and fixed index annuities in banks and broker-dealers as of December 2017. 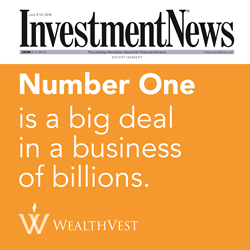 The 2017 report, released in April of 2018, has WealthVest ranked first of sixteen of the largest independent marketing organizations. In nine short years, Lincoln Collins and Wade Dokken have built a multibillion-dollar financial services distribution company. One primary factor of their success is their focus on the end consumer benefits of these retirement solutions. They have been instrumental in improving the benefits of fixed index annuities that provide baby boomers with principal protection and guaranteed lifetime income. This is the second time Collins and Dokken have built a company from scratch to the largest in the industry. Between 1988 and 2000, Wade and Lincoln built American Skandia from a brand new variable annuity entrant to the largest variable annuity company in the United States in the 1st quarter of 2000. WealthVest has established itself as an industry leader by providing financial advisors with face-to-face sales training and thought leadership in the form of white papers and sales tools designed to help financial advisors navigate the new realities of retirement. WealthVest has a team of eighty experienced wholesalers throughout the country serving 901 banks and broker-dealers with an advisor base of over 73,000. WealthVest has pioneered research on incorporating fixed index annuities in an optimized portfolio. It recently published its second publication on the topic titled “The Role of Fixed Index Annuities in an Optimized Portfolio” (Link to the white paper library). “The most important role we play in financial services distribution is providing the training and tools to make your advisors extraordinary,” said Wade Dokken and Lincoln Collins. WealthVest’s executive leadership team members have a long, varied history of success in financial services, having driven over $135 billion in annuity sales throughout their careers. The team’s experience and in-depth industry knowledge help to drive WealthVest’s success. With offices in Bozeman Montana, San Francisco, and a new office in Denver, Colorado, WealthVest continues to establish itself as one of the fastest growing financial services distribution firms in the country. Retirees or pre-retirees interested in learning more about fixed index annuities are encouraged to speak with their financial professional. Financial professionals interested in learning more about fixed or index annuities should reach out to WealthVest at 877-595-9325. 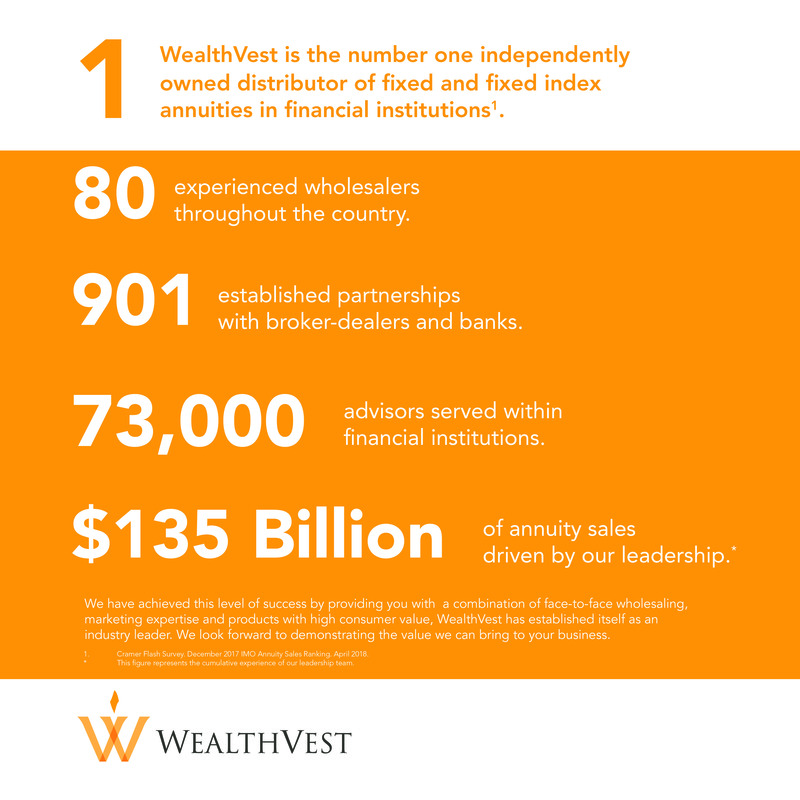 WealthVest is a financial services firm specializing in the distribution of high-quality fixed and indexed annuity products from top-rated insurance carriers. WealthVest designs, markets, and distributes these essential products throughout the nation and is squarely focused on developing products with the highest consumer value. WealthVest was founded in 2009 by former CEO of American Skandia, Wade Dokken, and former CEO of Hartford Life Limited, Europe, Lincoln Collins. From the beginning, WealthVest has provided financial professionals with thorough coaching, effective face-to-face sales training, and thought leadership on retirement planning concepts and products of the highest consumer value offering principal protection and lifetime guaranteed income.